Once again Team Fish Heads arises from the depths of the deep to serve our favorite dish to the masses: Fish, of some part or sort, along with lots of other edibles. Sounds like I need to start dropping a jig, minnow, or two. SET THE HOOK! I'm ON!! I dun bought me one them fancy side lookin' depth finders so I can just go look for 'em then drop a line down and catch 'em!! Don’t be telling stories old man. I really liked the additions to our team last year, hope they all make it back this year cause it sure did make it easier on us GOF's. I'm in again. Once we get a good crew together I'll take care of the shirts. I'll also supply some fish. Not sure how much fish I'll be able to bring, at least 30#s. I'll also bring some boudin I made for boudin balls. I'll get a supply list up soon. I have a 12X20 canopy I can bring and a fryer. Hoping you make it, you were sho nuf a team player last year. I still got the butane bottles too... my little one basket fryer, and pitch in on supplies. Mike, you still got left-overs from last year? I think we had the world's captured supply of serving "boats" and such. Yep. Lots of left overs. I need to get an inventory on it all before we go to get-n more supplies. I'll be good for tables and items needed for cooking. My popup didn't make it through the summer, Galveston winds got hold of it. Yall hang on. I'm a working a 12 day week that should end after Friday this week. We will know in a few days if we can make it. If so we will be in for the condiments again. You know we're good for the usual. I think I'll take you up on the Duane. Sounds good Duane. Make sure you bring it to Bonanza and I'll take it back in September. Good thing too! That three basket monster worked like a champ!! I have buckets and rope already. I'll be doing inventory Saturday. And post the list as soon as I get done. Being GOF he's an early riser, but I imagine he doesn't get out of bed until at least 2:30. What's up Team Fish Heads? Wasn't I supposed to do someth-n today? Just finished my mid morning coffee. Now I remember, the inventory list. Finished the list just in time for my afternoon/evening nap. Hey Boss we're back and will bring the cooker, oil propane tank and what ever else we need to!! Brandon, sounds burdensome, since I know how much you hate bait steal-n sandies. But we might take you up on it as time gets closer . Goal is to make 70-75lbs of fillets. Much more than that and we might not get finished cooking fish till after 3PM . Hopefully we can be done by noon like last year, so we can get out and socialize some more. I'll be hitting the water up here very soon for fillets also. Got a new Terrova I-link and Helix 10 SI GPS for my river Jon. Will do Brandon. As time grows near, we will know more. I'll let you know ASAP if we do. And thanks for the offer brother. Got you down for the LP, corn/canola oil, and your fryer Charlie. I don't think we'll need any plates with the food boats we have. And we've got an unopened box of 300 forks in the team box. I'm sure not everyone will use a fork . So we should have enough there (unless we fry something small besides fish, hushpuppies, and tators). Y’all got any caviar up in this joint?? I can arrange a caviar taco (aka roe taco) Just for you brother! I'll start save-n fish eggs tomorrow. Hell no. 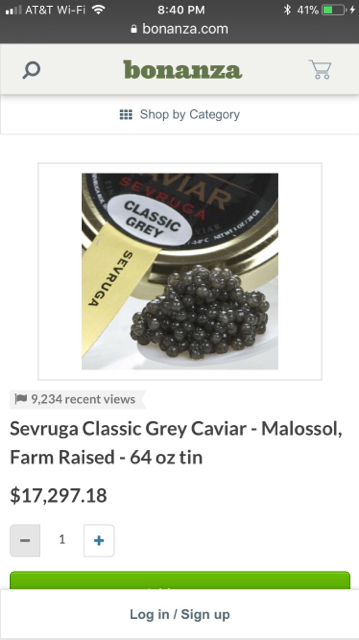 I want some of this here Bonanza caviar. I’ll pay it Bitcoin!! Put me down for the hush puppy fixin's. As usual, I'll need that recipe Mike.